STAY COOL - DANCE IN AIR-CONDITIONED COMFORT! For more information call 206-525-0932. 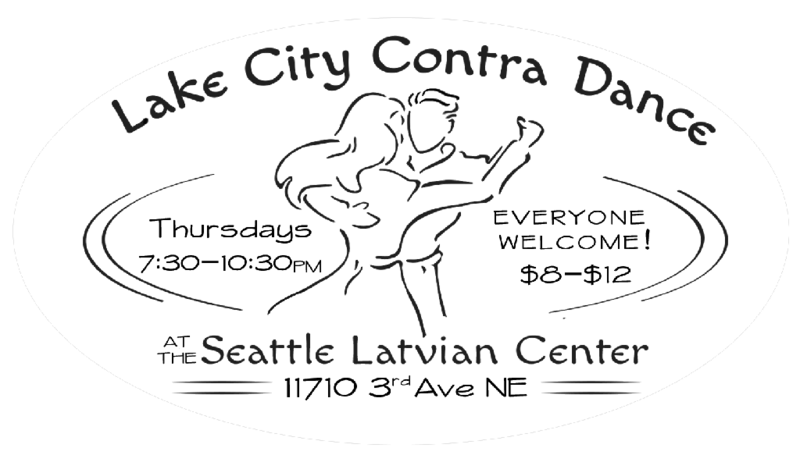 The LAKE CITY CONTRA DANCE moved to the SEATTLE LATVIAN CENTER in January 2018: for directions check out Google maps or this map that shows which streets do and do not go through. 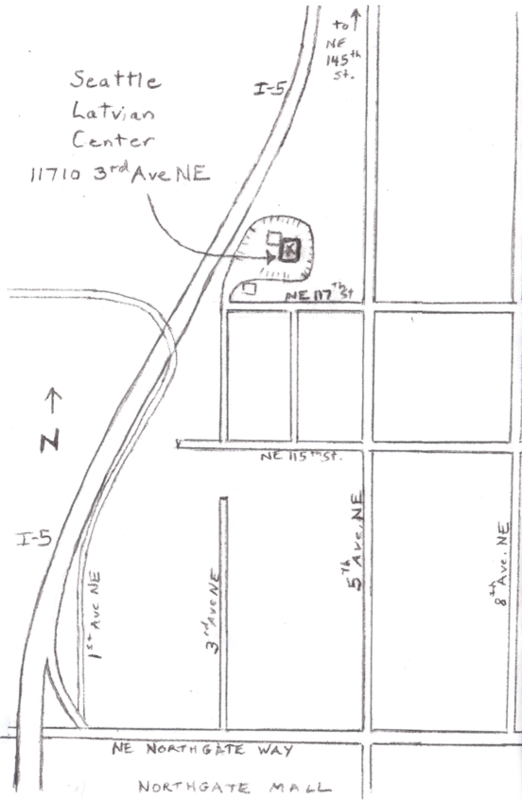 LARKS & RAVENS - Open letter to Lake City Contra Dancers - please read! Apr 18- You’ll get plenty high without any jet lag on this cross-country flight with “The TimeZones”: Rex Blazer (FL) on fiddle, Sue Songer (Portland, OR) on piano, & Chris Knepper (SF,CA) on guitar & mandolin. Caller Woody Lane's (Roseburg, OR) dynamic foot percussion adds to the excitement! Apr 25-Smooth as silk plus plenty of sass describes both the music of “Chassez” (Vivian Williams, Terry Wergeland, & WB Reid on fiddle, piano, accordion, guitar, & banjo-guitar) AND renowned caller LauraMe’ Smith! Enjoy!!! Also, we will celebrate April birthdays tonight! May 9- “Improper” (Sean Bolton, Melissa Coffey, Nick Leininger, & Julie Bennett on fiddles, flute, sax, guitar, & percussion) plays totally appropriate and thoroughly enjoyable dance music! Callers Craig Wolfe & Adam Bowman are sure to keep us smiling! May 30- The fun is in full bloom with the delightful music of "Heliotrope" (Robin Brown, Michael Hobart, & Paul Englesberg - Bellingham – fiddle, guitar, concertina, flutes)! Caller Valerie Cohen brings us a big bouquet of beautiful contras. Also, we will celebrate May birthdays tonight! June 27-“Continental Drift” (Eileen Nicholson-Kalfass – Syracuse NY - Eric Anderson, & Terry Wergeland – fiddle, piano, accordion); Michael Karcher & Richard Barnes callers Also, we will celebrate June birthdays tonight! July 25-Kate Powers, Marni Rachmiel, & Anita Anderson (fiddle, flute, sax, piano); Noah Grunzweig (Portland) will call "larks and ravens" (instead of "gents and ladies") - see linked info Also, we will celebrate June birthdays tonight! Contra (or Old-Time Country) Dances feature dynamic LIVE music, energetic dancing, friendly camaraderie, and a strong sense of community. Contra/square dancing is great fun and great exercise - for all ages! ∗	Contra dancing is traditional American folk dancing, derived from English and French country dancing. Couples stand in long lines. The caller “walks through” a pattern of figures before each dance begins, and prompts the moves as long as the dancers need it. Each couple dances the sequence with another couple, then progresses along the line to repeat it with new couples. ∗	Anyone can ask anyone to dance - it’s “people’s choice”. It is customary (not mandatory!) to change partners for each dance. When invited to dance, it is ok to politely decline. There is no need to feel guilty or to make excuses. If you are turned down for a dance, take it in stride and seek another partner; don't harass anyone who has repeatedly declined to dance with you. ∗	Callers use the terms"gents & ladies" (or "larks & ravens")to refer to thepositionsof the people in the dance – the "gent" (or lark) is on the left & "lady" (or raven) is on the right in each couple (unlike other social dances, either person in contra dancing can lead or follow depending on the figure). Dance with whoever is coming towards you in line, regardless of their gender. ∗	You don’t have to worry about footwork; justwalk smoothly, 1 step per beat of music. ∗	Connecting with each other and with the music is the essence of contra dancing. When dancing with joined hands, keep your elbows bent, pull back slightly, just enough to keep an equal counterbalance – keep your fingers relaxed, don't squeeze hands or twist wrists. ∗	Eye contact is another way we connect. Looking at each other will keep you from getting too dizzy – and it’s fun!!! If you're uncomfortable looking deeply into someone's eyes, you can look at their forehead, chin, ear…..
∗	In contra dancing, each figure fits with a musical phrase. It’s very satisfying to time each move so you can be ready to start the next in sync with the music, and with the other dancers! ∗	It's ok to make mistakes – no one is keeping score! People are friendly & everyone helps each other out. If you miss a figure, don’t worry about it - skip it and go on to the next. ∗	Dancing in a way that hurts or disregards the safety or comfort of other dancers is NOT acceptable!!! If someone does something that hurts or makes you uncomfortable, let them know - be clear, direct, and specific – subtle hints are often ineffective. If you feel awkward or unsure about your dancing or social interactions – ASK!! Callers, dance coordinators, and many experienced dancers are willing and able to help. ∗	At the end of each dance remember to thank your partner and the band! Show your appreciation for the talent, skill, and dedication of our fabulous musicians & callers – applaud heartily!!! ∗	Please welcome newcomers - ask them to dance, and help them have a fun, satisfying dance experience! Two of you can approach new couples and offer to be their partners, but don't insist that they split up. Trust that their "neighbors" in the line will help. ∗	Give your full attention when the caller is teaching, thereby setting a good example for newcomers (even if you thoroughly know the dance). ∗	Help newer dancers to face the right direction, and keep verbal instructions to an absolute minimum. Point, gesture, tap on the shoulder, use other signals, or call their name. It is hard for newer dancers to listen to the caller, you, other dancers, and the music all at the same time. ∗	Be considerate - refrain from extra twirls & spins, and high-speed swings with less experienced dancers. These are disorienting, slowing the learning process for your partner and for other newcomers for whom you are a role model. ∗	When helping other dancers, relax – be encouraging, and keep it light! It’s all about shared enjoyment, not perfection. Newcomers will learn faster and dance better when they are not anxious about their performance. ∗	Be sociable and resist the urge to “book ahead”. Go to the sidelines & ask those sitting out if they would like to dance. Please read footprints for a brief history of this dance series.